Apple Archives - Solar Love! Originally published on sister siteEV Obsession. When a former co-founder of a game-changing company says great things, you know you are on the right track. In this case, it’s Steve Wozniak showering praise on Elon Musk and company. The Apple co-founder said last week Tesla is the “biggest disrupter” in the US auto market, speaking to CNBC Asia. Wozniak added Musk has created the first blossoming automobile company since 1927. He also added Tesla is the first electric car which “feels normal” as you can drive it without any destruction. It’s been a roller coaster 2016 for Tesla. News including a fatal accident in Florida involving a Model S on auto pilot received a lot of negative attention, quite unduly. However, Tesla has also had some rock solid gains in moving forward EVs. It unveiled its affordable $35,000 Model 3 to an amazing number of pre-bookings this spring. It also opened its momentous Gigafactory. The Gigafactory is key to mass producing Tesla’s Model 3 and other vehicles. Tesla plans to not only disrupt the automobile industry, but also energy. It agreed to buy SolarCity in a deal earlier this summer, making plenty of sense for each side. SolarCity also plans to build solar roofs (not just rooftop solar), which will make it easier in the future for homeowners to go solar. “Disruption” has been the buzzword in late 20th and early 21st century business lingo. The Internet helped disrupt many industries, including telecommunications — Apple’s iPhone is a prime example. Now, those same principles are being felt across the automotive sector with Tesla as it pushes the limits in moving away from fossil-based transport. Who better to give an honor of disruption than Mr. Wozniak himself, a person who knows a few things about “changing the game” within industries? Perhaps even more impressive – Apple reportedly wants to develop 2 GW of clean energy in China, which is 50 times the size of the new 40 MW plant. That’s a lot of clean energy, especially for a business, and if Apple can achieve this figure, it would be very impressive. “Climate change is one of the great challenges of our time, and the time for action is now. The transition to a new green economy requires innovation, ambition and purpose. We believe passionately in leaving the world better than we found it and hope that many other suppliers, partners and other companies join us in this important effort,” said Tim Cook, CEO, Apple. Of course he’s right, climate change is extremely important, but there is another immediate need for China: reducing air pollution. This public health hazard contributes to millions of deaths each year there and even more respiratory problems. China burns a tremendous amount of coal, which obviously is a severe problem due to all the emissions. It would be fascinating to see what happens there if it comes to pass that one of the leading solar power generators is an American hi-tech company. It would appear that Apple’s rate of solar power development has surpassed that of some entire states in the US. For example, in Florida about 22 MW was installed in 2014; Apple may have surpassed that easily. State governments — any government bodies — aren’t known for acting quickly, so perhaps it is unfair to compare them to one of the world’s leading tech companies that prides itself on taking a leadership position. 10 years ago, presidential candidate John Edwards told voters there were two Americas — one for the wealthy and one for the rest of us. Edwards was right; there are two Americas, but the fault line is between those who take climate change seriously and want to take sensible steps to moderate its effects and those who are willing to sacrifice the lives, health, and welfare of the entire American population just as long as those same wealthy people continue to shovel money into their pockets. We used to think that business was leading the charge against any climate change action, but it turns out that is incorrect. After all, there will be nobody to sell things to if we are all dead, in nursing homes, or underwater. Today, more than a dozen large US corporations pledged to invest up to $140 billion in low-carbon technology, according to Business Green. The pledge is intended to demonstrate the level of support by corporate America for an effective global climate change treaty at the United Nations’ Paris Summit in December. According to reports, the group of 13 multinationals — including tech giants Apple and Microsoft — will join Secretary of State John Kerry in signing the American Business Act on Climate Pledge, which publicly commits them to reducing their carbon footprints and accelerating investment in clean technologies. In addition to the investment pledges, the companies will also agree to install at least 1,600 megawatts of renewable energy capacity, reduce water use by 15%, move towards using only renewable power, and target the delivery of zero net deforestation in their supply chains. Other companies expected to sign the pledge include General Motors, the Bank of America, Coca-Cola, Goldman Sachs, and Berkshire Hathaway. The White House says more companies are expected to sign the pledge later this year. The news comes at almost the same time as a pronouncement from current presidential hopeful Hillary Clinton outlining a bold new climate change strategy that includes the installation of $500 million worth of solar panels within 4 years of taking office. The plan would increase the electricity capacity the US has from solar energy to 140 gigawatts — 7 times the current level. The solar goal is part of a plan to add more renewable power to the grid in the next 10 years than during any other decade in US history. The added capacity will primarily come from wind, solar, hydro, geothermal, and other renewables. Announcing the goals on her website, Clinton said the US is “on the cusp” of a new era of energy generation. “We can create a more open, efficient and resilient grid that connects us, empowers us – improves our health and benefits us all,” she said. Conservative politicians are mounting a sustained and well-financed attack on any government regulations that impose stricter limits on carbon dioxide emissions, preferring to believe that climate change is just another liberal trick to enslave Americans and cost business money. Also published on CleanTechnica, EV Obsession, & GAS2. Chris DeMorro and I recorded our second “Cleantech Talk” podcast earlier today. It is embedded below for your listening pleasure. I’ve begun the process of getting the podcast included on iTunes, but it’s a bit complicated, so I didn’t want to wait for that to be complete to share this week’s episode. However, I did notice that the default setting on SoundCloud is to not allow downloading of the podcast, so I went and changed that in order to allow you to download the podcast in case that is a better option for some of you (the download button is in the top right-hand corner of the embedded podcast below). Whether you use an Apple or Android device, though, note that you can easily listen to the podcast via the SoundCloud app (Apple app here, and Google Play app here). The Fisker Karma Is Dead, Long Live…Elux? Will The Tesla Gigafactory Turn On Early? If you missed last week’s inaugural episode, check it out here: “Cleantech Talk” Podcast #1: Apple Electric Cars, Tesla Model X Spy Pics, Formula E, & Chevy Bolt. One of the largest tech companies in the world, Apple, will be constructing a $2 billion data “command center” powered entirely by renewable energy in Mesa, Arizona, according to recent reports. The very large data center is set to be built at a 1.3 million-square-foot former manufacturing facility previously used by First Solar, before the company scaled back its manufacturing operations a few years ago. After First Solar was done with the site, Apple purchased the site with the intention of leasing it to the sapphire-glass maker GT Advanced Technologies. With GT now bankrupt, though, that’s clearly not going to happen — hence the new plans, ones that were announced jointly by Apple and the Governor of Arizona, Doug Ducey. Given the fanfare of the announcement, it seems pretty likely that the company is quite serious about constructing the new “command center” for its global data center network. Considering that the project represents one of the largest investments ever made by the company, the commitment seems worth questioning. But it does seem to be there. Once completed, the project will result in the creation of more than 600 engineering and construction jobs. Construction will reportedly begin just as soon as legal control is regained over the site — with development ramping up very quickly, according to Apple. While the specifics aren’t currently known, Apple does seem to be clear on the fact that it’ll be powered 100% by renewables — and that part of this will be via new solar energy projects developed with the local utility Salt River Project. These plants will reportedly total at least 70 MW in capacity. Recently a huge list of mainstream corporations was published showing that many of them have their own solar power systems. In fact, if you total the number of megawatts for the top 19, there is about 440 MW of solar capacity. The largest solar power plant in the world has a capacity of about 550 MW, meaning that large corporations like Walmart, Kohl’s, Macy’s and Apple have a combined solar capacity not too far off that of the largest solar power plant in the world. Press about them tends to be about the individual company efforts such as IKEA’s solar power expansion at one of its stores in Michigan. However, the fact that well over 400 MW of solar power has been installed by large corporations isn’t talked about much, and this is a huge success story. Additionally, the cost of solar panels has dropped very much recently, so it might turn out that some of these companies will continue to expand their solar power systems. Does it surprise you that Campbell’s Soup and Macy’s have invested in solar power systems? (One might expect Apple to do so because it is a leading technology company.) These two are mainstays of American culture and have been in business for decades. The perception of solar power might be much more leaning towards ‘green’, ‘enviro’, ‘liberal’ and so forth but the great thing about solar adoption by large corporations is that partisan politics don’t factor in first. The decision to go with solar power has much more to do with economics. These businesses have been successful partly by being able to adapt to new conditions in the marketplace. They didn’t choose solar power based on personal preferences or whimsy. This fact is important because these companies are providing examples of successful solar adoption right now, not somewhere in the distant future. Their solar adoption is creating some positive press and the companies themselves sometimes publish information about their sustainability initiatives. If Safeway can invest in solar power, surely every day citizens can too. 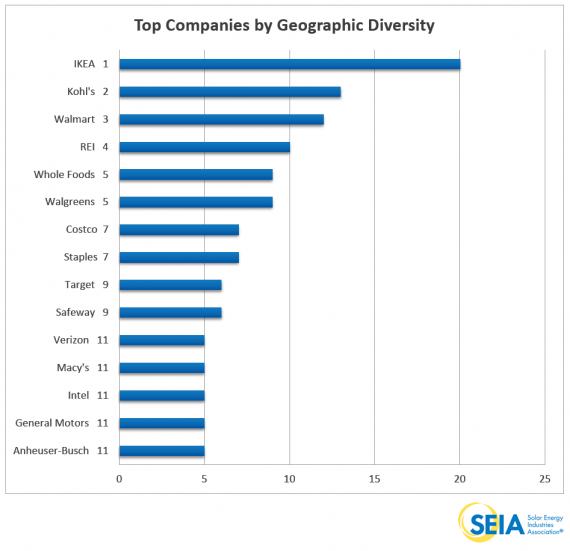 Verizon, Wal-Mart, Apple, Kohl’s, Google, UPS, GM, IKEA: these are just some of the American corporations utilizing solar power now. You may have noticed some of them are America’s most mainstream companies. Baseball, hot dogs, apple pie and Chevrolet used to be a common advertising slogan. Chevy was and is a mainstream American brand. 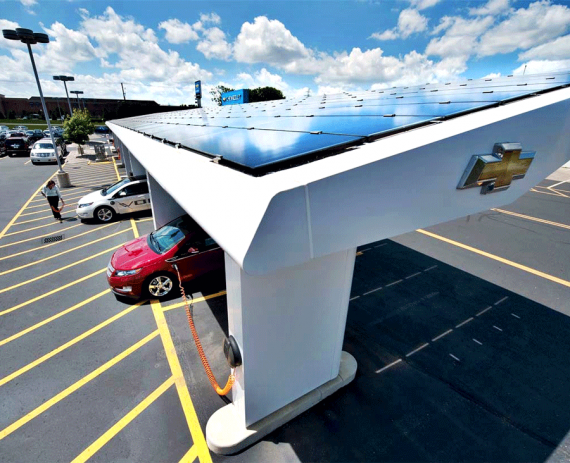 In June, it was reported that GM planned to install three acres of solar panels in Michigan. Last year, GM had 1.8 MW of solar installed at a Toledo plant. Kohl’s has even more solar power. This retail chain has 156 locations with solar, over 380 LEED certified buildings and over seventy EV charging stations. Wal-Mart is the largest commercial owner of solar, but this fact might be slightly misleading because Wal-Mart is also such a large company. Even if it gets a tiny percentage of its electricity from solar, that total amount might be huge compared to smaller companies’ clean energy technology. Verizon has invested almost $140 million in renewable energy, “By almost doubling the amount of renewable, solar energy we’re using, we are making further progress toward Verizon’s goal of cutting our carbon intensity in half by 2020, in part, by leveraging the proven business case for clean-energy alternatives to the commercial power grid,” explained James Gowen, Verizon’s chief sustainability officer. 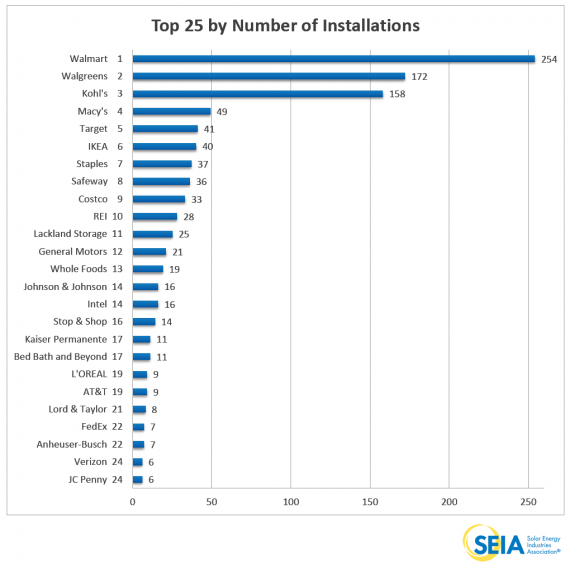 Last year, the Motley Fool wrote that Wal-Mart had some solar power at 200 of its 4500 stores. Two hundred stores sounds impressive, but it is less than 5%, meaning that about 95% of Wal-Mart stores did not have solar power. Still, solar power has been attractive enough for even his mainstream retail giant to invest in it. Wal-Mart’s green activities might get more press, but IKEA’s percentage of locations with solar power was well over 80% in 2013. 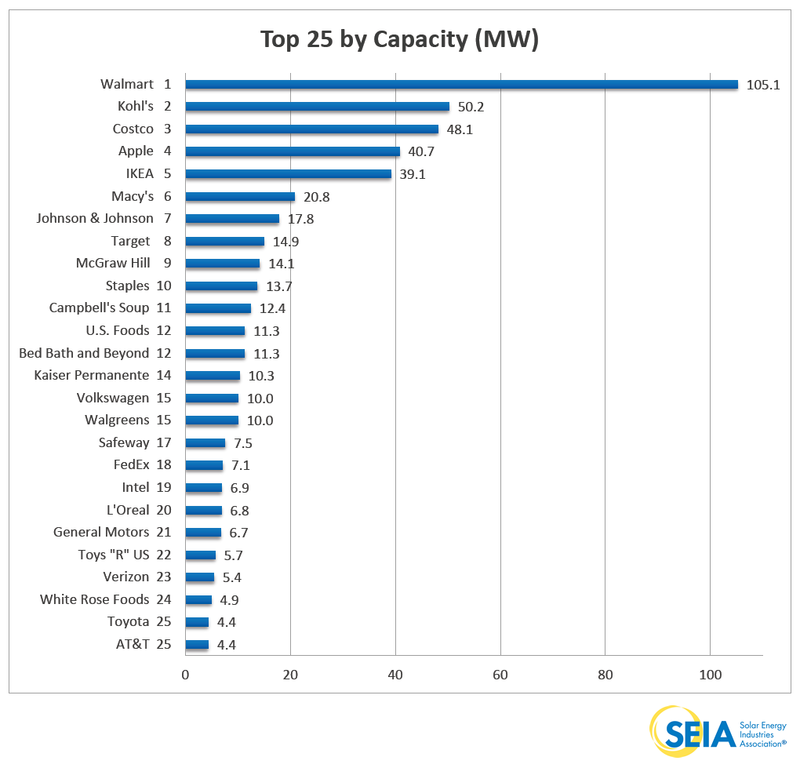 Obviously, 80-90% is much greater than 4-5% but Wal-Mart still gets credit as a leader in solar power sometimes. “There has to be a rational business decision with a decent payback. Any business with access to capital has a choice of where to invest. Of course, you can invest in growth of business, and we do that, but we also look at what delivers long-term energy security, a macro hedge on energy price rises and addresses carbon. IKEA also has a long-term business philosophy, where we own most of our stores, our factories, and the land they are built on. We have the capital, so why would we rent? It’s the same with energy – if we can own our own energy production why would we not want to do it?”, said an IKEA executive. It has been demonstrated by a number of mainstream American corporations that investing in clean energy can save money. In fact, about one billion dollars a year has been. So, will solar power become as American as hot dogs and apple pie?